South Dundas to rethink Not A Willing Host? MORRISBURG – A proposed ground-based solar farm has South Dundas revisiting whether it’s not a willing host for green energy. Solar company SunEdison has approached the municipality asking for support for a solar farm at 4278 County Road 1, south of Glen Stewart, on a private piece of land. The company is hoping to get municipal support in order to receive preferential scoring when applying to the province’s Feed In Tariff (FIT) program. South Dundas council heard Tuesday night the proposed site, which could be anywhere from four to 10 acres, is not farmable land. “That same footprint, the top soil was stripped in 1997,” Planner Don Lewis told council. “I have no problem with it…it’s a business proposition,” Deputy Mayor Jim Locke said. But Locke used the moment to chastise the province and its electrical regulators. “Hydro One, IESO (Independent Electricity System Operator) and the provincial government have done a terrible job of informing the public on what’s going on with electricity production in this province,” Locke stated. Piggybacking off comments from Coun. Mellan and Coun. Marc St. Pierre, Mayor Evonne Delegarde also expressed concerns with endorsing a green energy project. “I did pull out the (not a willing host) resolution once again. I know we only pertain to the wind but I think the solar is in the same ball park,” Delegarde said. 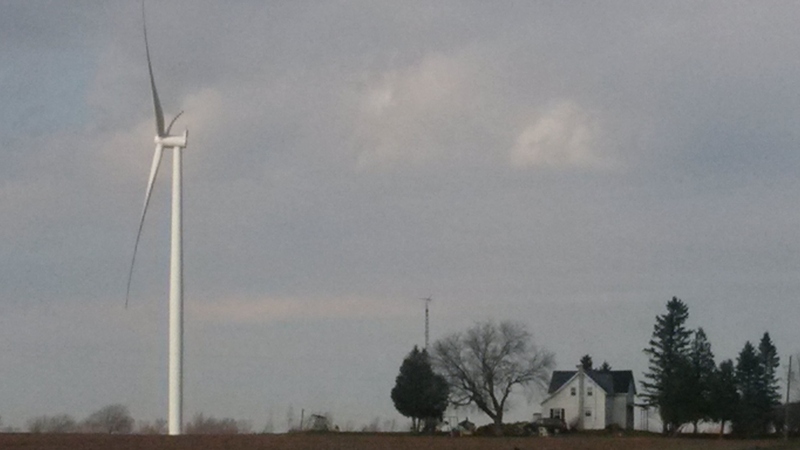 South Dundas committed to being a non-willing host, specifically pertaining to wind power, in October 2013. While South Dundas has approved a number of roof-top solar units on a site-by-site basis, this would be the first ground-mounted solar farm in the municipality. “We did the rooftop site by site but that’s a lot smaller project that you would even think about in this case or in a wind project basis. So, I don’t support going forward with this,” the mayor said. A report on the non-willing host will be back at council in two weeks. WEBSITE EDITOR’S NOTE: Once again, if the province had ever done a cost-benefit study for its renewable power program, municipal officials wouldn’t be tossing around advantages and disadvantages in the dark—with electricity bills rising every six months and the economic impact of expensive, intermittent renewables more apparent than ever, Ontario wouldn’t want to do a cost-benefit study NOW. 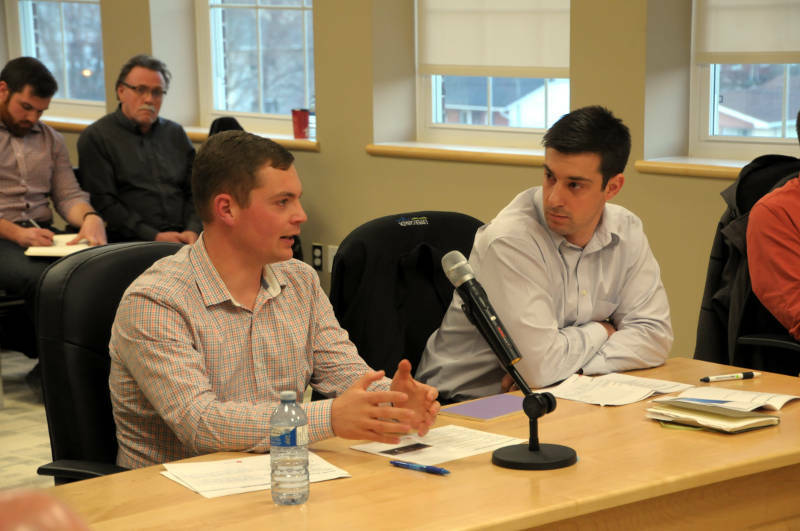 Ken Little (L) and Thomas LoTurco of EDP presenting to South Dundas Council in April: everything is tickety-boo. EDP Renewables held one of its mandatory community liaison meetings last night, ironically in Dixon’s Corners where so many community meetings had been held by residents opposed to the project. The wind power project is a great success declared project manager Ken Little. 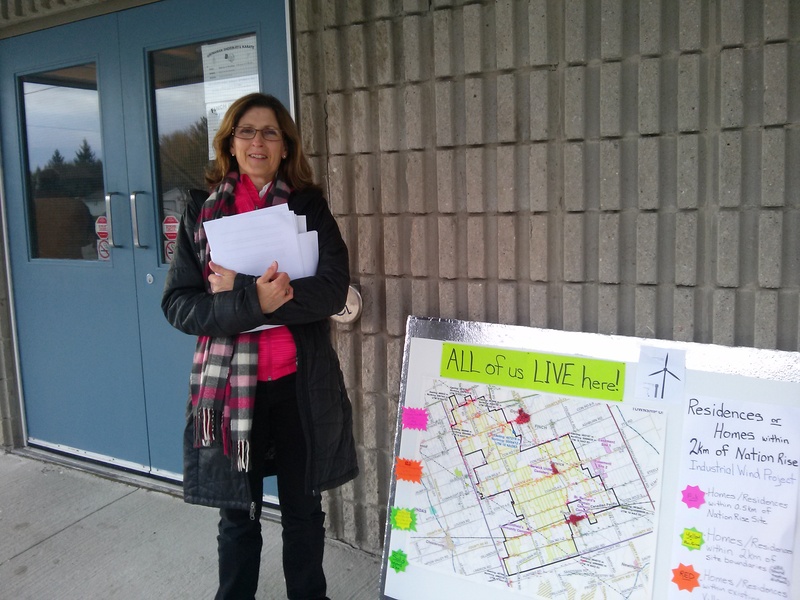 He dispelled concerns about the “charge of lease” issue*, and noise complaints, and insisted that the community is in favour and supportive of the power project. The Ministry of the Environment representative from the Cornwall district office was also in attendance and admitted that the power developer has yet to file its mandatory noise testing report, as the required higher wind speeds have not been achieved. Therefore the Ministry does not have appropriate data and does not intend to pursue any enforcement action for non-compliance with the regulations. This statement was a shock to those present who have lodged noise complaints (Ottawa Wind Concerns is aware that the first noise complaint was filed two weeks after the turbines began operating). People in at least one residence in Brinston lodged enough complaints that the Ministry conducted a noise audit on site—those results are not available to the public, the MoE representative said. *Editor’s note: Mr Little is following the wind power lobby group guideline of claiming the charge of lease “issue” (where developers can obtain financing which is then registered on title) is simply a rumour, and is “nobody’s business.” The fact is, the charge of lease potential is yet another characteristic in wind power leases that land owners need to be aware of, and can affect their ability to obtain financing.